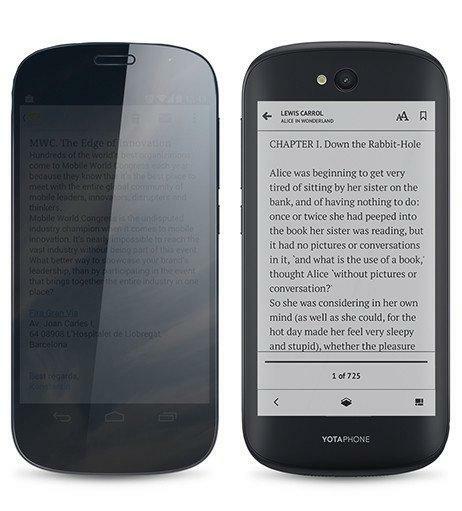 YotaPhone 2 is the world’s first dual-screen smartphone which provides a brand-new experience by combining the uses of Electronic Paper Display with features of Android OS. It can provide us with an experience of Hands-free messaging along with E-Reading capability upto 100 hours with a single charge. Both screens are boasted to give Full Android functionality with a fully customizable always on-screen. Electric Paper Display is a technology that consumes very less energy and thus is battery efficient even if it is always on. It can provide us a full user experience and we can access apps like Facebook, Twitter, Blogs etc and everything else even under the brightest of sunshine. YotaPhone boasts to provide upto five-days reading on a single charge and with YotaEnergy app, it can be further extended to few more hours. YotaPhone 2 EPD promises to provide a customizable user-experience. We are allowed to create multiple dashboards with various widgets like E-mail, Calender, Twitter etc or we can display pictures which can be selected via Gallery. This dual screen smartphone also gives us special apps for the second screen which includes some apps like YotaSports-Track your favorite teams, YotaFit- Your fitness at glance, SocialApps-Includes all you required Social apps, Yotagram-Secure messaging etc. 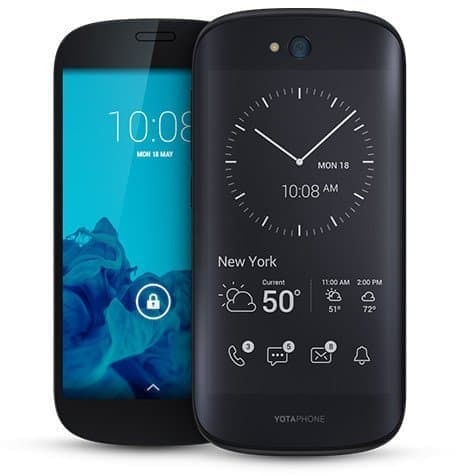 On the hardware side , the YotaPhone 2 sports a 5-inch AMOLED Full HD display ( 1920×1080 pixels ) with a protective layer of Gorilla Glass 3 along with the 4.7-inch EPD ( 960×540 pixels ) which is also supported by Gorilla Glass 3. It is powered by a 2.2GHz Quad-Core Snapdragon 801 processor bundled with 2GB of RAM . It runs on a 2500mAH battery under the hood along with Quick-Charge technology. The smartphone features a 8-MegaPixel rear camera with LED Flash support and a 2.1-MegaPixel front-facing camera and will be running on Android 4.4 KitKat which can be upgrade to Android 5.0 Lollipop. For the Connectivity front it includes Wi-Fi 802.11 a/b/g/n/ac, Bluetooth 4.0, NFC and A-GPS+GLONASS. YotaPhone 2 is supposed to be in partnership with apps like MusixMatch-The lyrics destination, Bookmate-The e-book reading service, Psyx-Your fitness tracker, StayTuned- the app organizer. It will also provide extra accessories like Bumpers, which will be available in quite a few color variants and a portable PowerBank. The YotaPhone 2 will be priced at 500$ for the first 100 people and will be available for 525$ for the next 48 hours and after the time period expires, it will be available for 550$ till next 61-days and can be purchased via Indiegogo. The goal is to reach $50K and with in a day they’ve already reached 245% of funds ($122,601) which is far more than their goal. This is an example that people love innovation and always be in favor of innovative gadgets. As of now the $500 perk is already sold out, and the remaining perks are selling out as hot cakes. Next articleSo many smartphones launched in India , Confusion in choosing!